Snappy and sweet, these oat bars are a wonderful dessert recipe. Serve these crispy bars with tea or coffee, and you’re set. A drizzle of chocolate finishes them off perfectly! Line 13x9-inch pan with parchment, with ends of parchment extending over sides. Beat butter, sugar and vanilla in large bowl with mixer until light and fluffy. Whisk together flour, oats and baking powder. Gradually beat into butter mixture. Press evenly into bottom of pan. Bake 23 to 25 min. or until golden. Cool 15 min. in pan. Lift from pan by parchment edges; remove to wire rack. Cool completely. Drizzle with melted chocolate and allow to set, about 2 hr. Cut into 24 bars. Substitute Baker’s Semi-Sweet Chocolate for Baker’s White Chocolate. 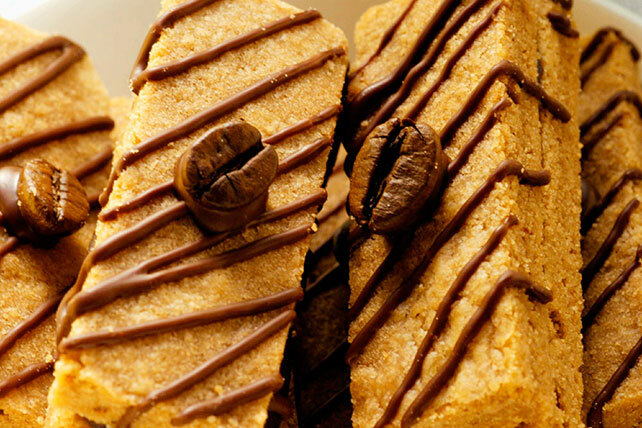 Top each bar with a coffee bean. Place large flaked rolled oats in food processor or blender. Process until fine in texture.